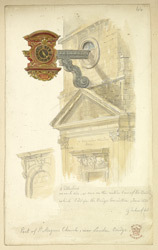 This is a watercolour detail of the ornate clock of St Magnus the Martyr in Lower Thames Street. St Magnus is dedicated to Magnus, Earl of Orkney, an influential Christian who was murdered in 1116. A church has stood at the Lower Thames Street site for over 1,000 years. The present building, which supports an impressive 185 ft tower, was designed and built by Sir Christopher Wren in 1676. The church's interior was described by T.S. Eliot in his poem "The Waste Land" as being an "inexplicable splendour of Ionian white and gold..".